Honey, especially the NZ Manuka honey is amazing. Not only does it taste good, it has got all these anti bacterial qualities. The Maori already knew this 100s of years ago, and used the honey to treat wounds for example. 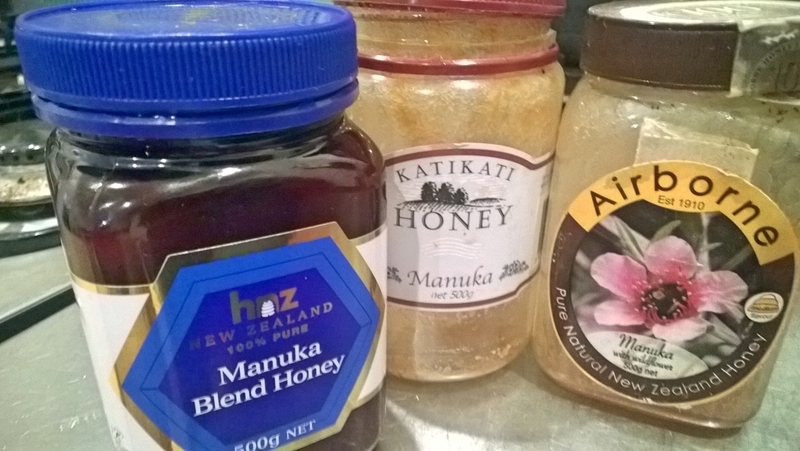 Fairly recent research has shown that there are indeed natural antibiotics in pure Manuka honey that are potentially stronger then the chemical ones we’ve gotten so used to. Eating a spoon of Manuka honey when having a sore throat will actually sooth it, but also kill the bacteria. And you can use it for example if you have nothing else at hand to clean and close scratches on your body. The great thing is it just also tastes so good! Rub some honey over some lamb chops, add some thyme and grill them. Or put some camembert on a piece of French bread, poor some honey over it, sprinkle some ground pepper and rosemary and grill it for a minute or so until slightly softened. or as i did tonight mix some fresh ginger and honey with soysauce and sesame oil for a great stirfry mixture. This entry was posted in A to Z challenge, localfood, nz general, Something Good and tagged a to z, honey. Bookmark the permalink. Manuka honey is definitely the most delicious in my book. I like it with peanut butter. Yummm.